Staco Energy is a leading provider of high quality voltage control and power quality solutions tailored to meet their customer’s needs. Featuring UPS systems designed for desk top PCs to large data center systems, Staco Energy has a solution for your power protection needs. The Staco Unistar V UPS is a single phase Uninterpretable Power System that is a designed as a true online double conversion UPS for 120VAC applications. The UPS can be either rack or tower configured. With a size range from 1000VA to 3000VA. The Staco Firstline P UPS is an Uninterpretable Power System that is a designed for small to large installations and has a wide size range from 100kVA to 500kVA system all in a front access enclosure. These modules can be paralleled up to eight units for large facility backup. 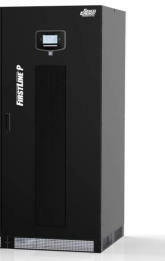 The Staco Firstline PLT UPS is an Uninterpretable Power System that is a double conversion UPS in a size range of 10kVA to 60kVA. In both 208VAC and 480VAC models with the big advantage that these models can be paralleled for redundancy. The Staco Unistar VP Single Phase UPS is an Uninterpretable Power System that is a designed for small to medium installations and has a size range of 6kVA and 10kVA units. Comes both as a tower and rack mount design and can be paralleled up to three modules. This to allows for redundancy of the UPS modules and for expansion of the critical load over time.